Bee is such a sweet girl. 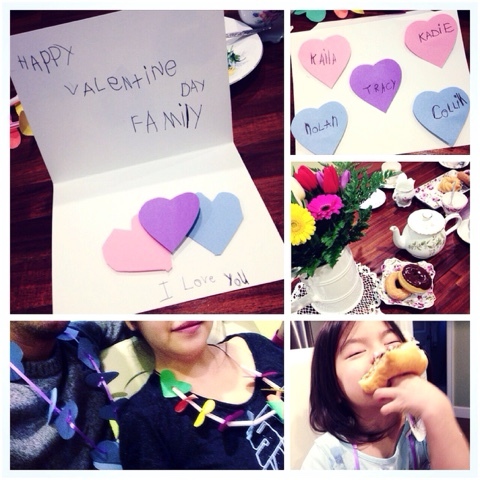 She woke up early on Valentine's Day, around 6:30am to make a card for us (I heard noises in the kitchen). I got up and came out around 7:30, to see what she's doing. She made us a card and a necklace for everyone, even baby. She asked me to cut her up paper hearts for her to put on her card and the necklaces. She's so sweet and thoughtful. When C came back he got me a bouquet of flowers and donuts !!! We all put on the heart necklace Bee made for us and had a small tea party. Donuts taste so good for breakfast. The girls love it (expected of course). We definitely will do this again.